There's much more to Valentine's Day than a second-rate meal and a box of chocolates... Impress your loved one with something special this Valentine's. Hmmm, but thinking outside the box requires so much effort doesn't it? No! We've done the hard work for you. Read on to find the best of Valentine's Day in London. Your Hot Date awaits! Luminous colour and languid figures seduce at this Tate Modern show. This well received Tate Modern exhibition on French painter Pierre Bonnard, "throws windows and doors open on to sun-drenched gardens" (Telegraph). A friend and contemporary Henri Matisse, Bonnard is well known for his unconventional use of colour and his preference to work from memory. Showing around 100 of his greatest works, this Tate Modern exhibition emphasises Bonnard as a 20th century artist who had a profound impact on modern painting and would become an influential figure for later artists like Mark Rothko and Patrick Heron. Spanning four decades from 1912 to his death in 1947, the exhibition includes breakthrough works like Dining Room in the Country and The Lane at Vernonnet. A sensual cast of five couples chart the history of Argentine tango. The pop-up presents an intimate hut for two with views over the River Thames. This year's floral festival is inspired by the biodiversity of Colombia. A stunning visual treat, this year's Orchids Festival at Kew is inspired by the biodiversity of Colombia, which is home to 4,270 species of orchids. Thousands of orchids and tropical flowers are used at the festival to create a colourful route along with a display of a carnival of animals depicting a toucan in flight, a hanging sloth and a swimming turtle. There will also be hundreds of colourful butterflies suspended from a glass ceiling. On selected evenings, you can visit the display for a series of special after dark events with music and workshops. Choose from romantic rooftop films, Cupid's Cabaret or a special Motown Supper. Throughout February FEST Camden gets ready for romance, transforming its historic spaces to offer cosy ways to get coupled up - whether watching romantic films at the Rooftop Cinema or going to Cupid's Cabaret via a special Motown Supper. From 10th until 17th February (excluding Friday 15th), romantic films like Harry Met Sally, Romeo Juliet, Dirty Dancing, True Romance and The Notebook are screened in the winter themed space. On Valentine's evening itself, The Birdcage Cabaret Club will be decked out with classy romantic decor and red roses on the tables, while a specially seductive cabaret is hosted by Cupid herself aka drag legend Ruby Murry. Expect burlesque, drag acts, circus, song and dance and a special appearance by West End Star Rosalind James. In the live room the Motown Supper evening pays tribute to the legendary Motor City with live Motown music and three courses of soul food. Push the boat out and set sail on a romantic river dinner date. Set sail on a romantic river dinner date in a Tom Dixon designed dining room this Valentine's, taking in the sights of the city, from Big Ben to the Tower of London. Departing from Embankment Pier, Glass Room serves up a decadent meal - three courses for lunch, five for dinner - on tables decorated with roses. Push the boat out and splash out on the evening meal and you'll get sparkling prosecco, a main course of roast chicken breast with calamansi tart, raspberries and creme fraiche for pudding. Don't worry if you didn't make it to the gift shop - you'll get a box of Charbonnel et Walker truffles before you go. Take your love to new heights (sorry) when you book in for a walk Up at The O2 with your partner this Valentine's Day. After a steep climb to the top of the famous music venue you'll be rewarded with remarkable views across the capital and a glass of Champagne Lanson. From 52 metres above the O2 arena you can see the skyscraper of Canary Wharf and the curving sweep of the Thames. Add a touch of romance by choosing a Sunset or Twilight Climb and you can take in the capital's cityscape lit up by thousands of lights at night. Three evenings of fantastic films under the bones of a big whale in the great hall. Following a sell-out season of Halloween screenings, 'Movie Nights at the Museum' returns as The Luna Cinema teams up with the Natural History Museum for three evenings of traditional and not-so-traditional Valentine's films. Screened in the impressive Hintze Hall, under 'Hope' - the 25 metre long Blue Whale skeleton - the Natural History Museum is the perfect place to impress your date. Falling into the 'traditional' category of romantic films, '90s classic Pretty Woman and Love Actually are on the programme along with tear-jerker The Notebook and recent Lady Gaga musical A Star Is Born. Alternatively, if you're Kill Bill Vol 1 or Ridley Scott's Thelma and Louise. Tickets include a complimentary box of popcorn and access to the Life in the Dark exhibition between the 14th and the 24th February. That's next week's date night sorted. Forgo the commercial kitsch this has to be one of the most romantic places to visit on Valentine's Day. "I almost wished we were butterflies and liv'd but three summer days - three days I could fill with more delight than fifty common years could contain." John Keats' letters to Fanny Brawne are among the most beautiful and touching ever written. 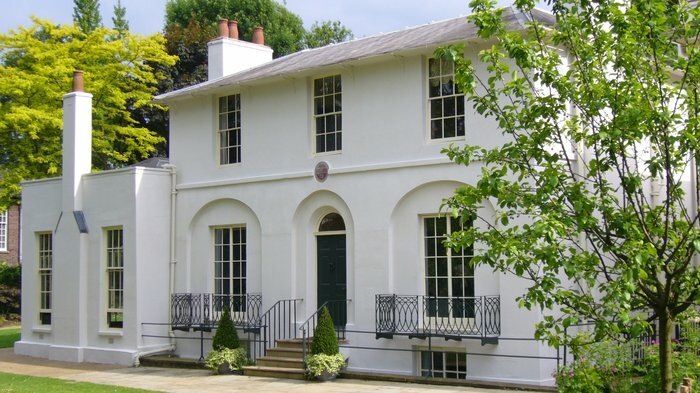 Forgo the commercial kitsch, Keats House has to be one of the most romantic places to visit on Valentine's Day. The special late night event will explore the work of the English romantic poet and includes a tour of the house, live music, a fan making workshop and lessons on 'fan language' as well as a drink at the pop up bar. Not just for couples, this event is for the lovers of literature and life. A supper club that will transport you to the romantic Sicilian hillsides. Be transported to the romantic Sicilian hillsides as Strazzanti, the supper club founded by Emilia Strazzanti, brings almond blossom season to East London with a bespoke blossom tree installation by McQueen's florists. Taking place over three nights - 14th, 15th and 16th February - at Hackney Coffee Company, you'll surrounded by beautiful white blossom flowers, making it the perfect setting for that special Valentine's Day dinner. The five-course menu, a celebration of Sicilian almonds, starts with aperitivo and antipasti and uses locally sourced artisanal and Sicilian produce. Pork belly and mozzarella croquettes and cherry tomatoes are accompanied by the classic Aperol Spritz. An aubergine, mint and almond pasta dish is served with fresh ricotta while all three of Strazzanti's signature cakes finish the feast. The London planetarium presents a starlit show about the Valentine's night sky. Share a romantic evening under the stars at the Royal Observatory Greenwich, with a planetarium show about the Valentine's night sky; stargazing through the 18-tonne Victorian telescope and enjoying beautiful views over London from the Prime Meridian while keeping warm with a hot drink. You'll come over all starry-eyed at this adults-only evening event which includes a planetarium show about the romantic sights in the night sky. A real Valentine's Day treat, a romantic meal and live music in the OXO Tower. The Oxo Tower Restaurant and Brasserie are both laying on special feasts this Valentine's Day, providing the chance to enjoy a romantic meal and live music with the sparkling London skyline as a backdrop. At the restaurant, diners will be able to feast on a two or three-course menu with a bottle of Champagne. Dishes include cured duck breast with gingerbread and fresh truffles, wild sea bass with clams and Champagne sauce followed by passion fruit souffle with coconut rum sorbet. In the more casual brasserie, diners are treated to two or three courses, a bottle of Oxo Brut NV Champagne and chocolate and chestnut mousse with pears and almonds to finish. Prices start at £65 per person. Inspired by the Victorian tradition of expressing emotions through the giving of certain flowers, Mr Fogg's House of Botanicals is filled will floral cocktails holding hidden messages. On Thursday 14th February, lovers can embrace romance and indulge in bottomless tipsy teapots as well as sweet and savoury treats. There's a choice of three teapots: Forget Me Not, representing love; My Sweet Pea, for pleasure; and Red Tulip, showing true love. As night falls there'll be live entertainment from the vintage singer, Bunny Nightingale. A wonderful way to embrace blossoming love. A special late-night, love-struck edition of the hit fringe show. From cheap budget hotels to luxury 5 star hotels see our discounts for hotels, including The Royal Horseguards - A Guoman Hotel from 44% off.